There is a crispness sneaking into the late summer air that is a reminder that fall is just around the corner. This is the perfect time to spend evenings and weekends outside on the porch, deck, or patio. 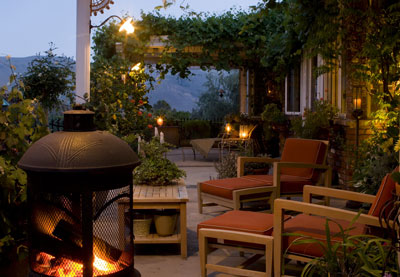 Enhancing your outdoor space with lighting can create a relaxing ambiance as you relax and enjoy the weather. Outdoor Lighting Many homeowners make the mistake of lighting their outdoor space with one large or overly bright light. The trick to creating an ambient outdoor room is to include multiple sources of soft light. Most homes already have a single wall lantern mounted to the side of their house. Consider adding 1-2 additional, matching lanterns to the side of your home. This will create a more even spread of light. If your outdoor room allows, adding an outdoor chandelier or hanging lantern can be a stunning way to illuminate the space. Placing path lighting can ad a romantic feel to your landscaping. Overall, the key to lighting your outdoor space like a pro is choosing a variety of lighting to create a warm pool of light versus using one bright source of light. Visit Hortons Home Lighting today to find the best lighting for your outdoor space.